Leading Manufacturer of pw storage tanks, pw - wfi storage tanks and purified water storage tank from Mumbai. We are among the top most organization in offering a premium quality range of PW Storage Tanks to our clients. We are the prominent manufacturer and supplier of these quality range. Our products are widely demanded and appreciated by our premium clients. These products are available at market leading price. The capacity vanes from 100 lit. to 20,000 lit. We are engaged in the business of manufacturing and supplying the best quality WFI Storage Tanks. It is widely acknowledged for its robust design and compact size. Widely known for its high strength and high efficiency, the entire range offered by us has amassed intense praise among the client base. 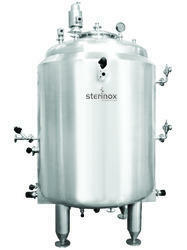 These storage tanks are offered in a wide capacity range. We are counted amongst the trusted names in manufacturing, supplying and exporting an exclusive range of Purified Water Storage Tank. 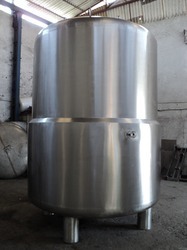 These Purified Water Storage Tanks are widely used in various industries for its quality features. 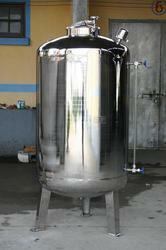 These Purified Water Storage Tanks can be availed from us at very economical prices. In house hydro test facility is available. Jackets are tested at up to 6 Kg/cm2 pressure and limpets are tested at up to 10 Kg/cm2 pressure. Material testing certificate will also be provided.